The Broken Bike Boy and the Queen of 33rd Street by Sharon G. Flake, read by Bahni Turpin. Listening Library, 2007. 2 hours and 30 minutes. Reviewed from library copy. When a new kid shows up at her school, Queen can't help but speak the truth: he stinks. He's weird, too, and he claims that he's a prince from Africa. So why do her classmates treat him like he's something special? Queen knows he's lying and she sets out to prove it. And along the way, she just might find out that there's more to him than meets the eye. An unlikeable narrator. Tricky stuff. But Sharon Flake pulls it off, making Queen exasperating and eye-roll-worthy but still redeemable. Even as I was groaning at Queen's conceit, I was rooting for her to figure things out, to make the changes she needed to make to find her place in the world. Narrator Bahni Turpin is a great match for the text, making Queen self-absorbed but still relateable. I think this would be a great choice for a book discussion because there's lots to talk about here. I did have one small problem - Queen seemed younger than a fifth grader to me. I had to keep reminding myself that she was in fifth grade and not second or third grade. But that didn't detract from my enjoyment of the book. Read another review at Semicolon and check out an interview with Sharon Flake at Cynsations. 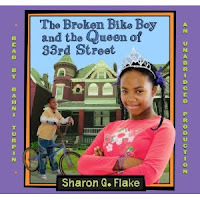 The Broken Bike Boy and the Queen of 33rd Street is on shelves now! Hey! I'm an Audible affiliate, so if you make a purchase from them after clicking on one of my affiliate links, I may receive a referral fee.